Startegy to Clear JEE Advanced : IITs are the most prestigious engineering institutes in our country. Every engineering aspirant might have thought about this at least once. It’s more than just a college, it’s an experience worth having. From smart ideas, hardworking brains, sophisticated infrastructure and highly educated professors – all this coupled with all your friends under one roof will create magic, won’t it? But, let,s get out of this hypothetical state and face the reality. 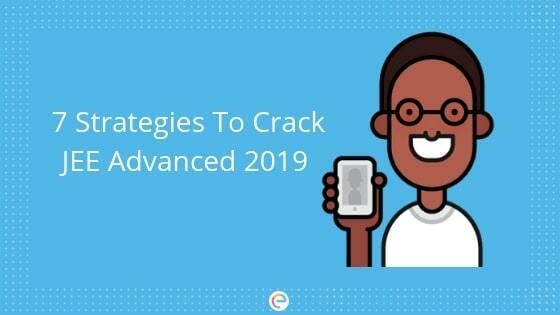 At present, you need to be very clear what will be your strategy to clear JEE Advanced. First, ask yourself – do you want to crack IIT JEE or do you want to crack IIT JEE with a top rank. Both are two different things, decide what you want. Be confident and you will achieve what you set out for. First and foremost, the strategy to clear jee advanced should be very clear. Though there is not any particular strategy that works with every aspirant but the tips below may help you in preparing your own strategy. At least try to solve 60 problems from day 1 including PCM. Keep track of your efforts so you never make the same mistake twice. It’s good to have a target so you know what you’re working towards. Always aim to achieve that. Give your best till the end. Do not give in to slack as that will be easily become a habit. Focus first on the difficult topics along with concise, crisp, easy-to-look-up notes. Strategise your study plan accordingly based on the previous years’ patterns. Be practical and decide if you can clear the IIT JEE on your own? If not, then join coaching classes. Better yet, you can opt for online platforms like Embibe where you can get access to up to 15,000 concepts – all in one place! You can also practice IIT JEE questions and take JEE mock tests online for free! But more than that, you get personalised coaching wherein you get a detailed test feedback after every test which helps you pinpoint your mistakes and identify your weak areas that you can improve upon. This test analysis is responsible for the score improvement of scores of students who have practiced on Embibe. It’s time for your score improvement too! We hope the information provided in this article helps you. If you have any questions post it in the comment box below. We will get back to you at the earliest.